In this very practical article on parenting, Mahesh & Bonnie Chavda mention some important things we can do for our children. I wish I had read it when ours were small. As a new parent it was difficult for me to know what to do and where to turn when problems arose. We were first introduced to them at a conference in Kansas City in the early 1990s. At that time Mahesh had done 26 forty day fasts--one a year for the past 26 years. I was amazed! I didn't know anyone who had done even one! I know that some of you may find this hard to imagine but when we were at a another conference featuring Mahesh several years ago, as he was speaking gold dust began accumulating on his face and his clothing. He tipped his Bible to the camera so we could see that the page was also covered in gold dust. The longer he talked the thicker it became. Everyone at the conference of about 1000 people could see it. He is a humorous, practical man of God who sees many miracles in his ministry. He travels throughout the world testifying of God's greatness and grace, introducing many thousands to Jesus. At a time of great trouble for Israel, God put His finger on a particular barren couple in order to bring supernatural deliverance for His people. When the Angel of the Lord made the announcement, Manoah asked, "Teach me how to raise this child?" He recognized that God had a set destiny and purpose for the miracle son that was to be born, and he desired to set the course for his son to fulfill the promise. This is the heart of every parent. This week we thought it would be good to share with you some of the parenting lessons and wisdom we have learned over the years. Manoah had one thing right. Before he even held his miracle child in his arms he started his journey to parenthood with prayer. Never underestimate the supernatural power of prayer. If Jesus prayed for His disciples, how much more do we need to pray for our children? Plead the Blood over them. Proclaim the blessings of Deuteronomy 28. Declare Scripture over them. Pray for them to grow in stature and favor with God and man. Cover their teachers, peers, schools. Seek God's counsel, wisdom, and intervention for particular situations they face. If you have a child that is going through a rascally season, don't despair. Prayer is your answer. Remind the Lord of the prophetic promises He has given you for your child. Aggressively plead the Blood over your children. Hold them before the Lord as you take communion. Your child may stray, but the Lord will honor your prayers. Like Abraham's intercession for Lot, God will loose angels to grab your child and pull him back to safety. He will bring your children back to their borders. God has given you the authority as the priest in your home to bless your children. A great picture of this is when Samuel anointed David as king. Samuel identified David. He called him by name. He spoke his future destiny over him. He poured oil, a symbol of the anointing of the Holy Spirit, over him. His blessing set David apart and released divine power from Heaven to protect, empower, and transform David from shepherd to king. As a parent, you are the priest with the anointing to speak into, call forth, and anoint your child to rule and reign in Christ. Psalm 127:3-4 tells us that children are a heritage from the Lord. They are like arrows in the hands of a warrior. Arrows are not meant to rest in your quiver. They are shot out for a purpose in a set trajectory. That direction is set by the parents. The Lord will correct and fine tune their path as they mature and grow, but as parents, your responsibility is to set your children's course. We live in days where every aspect of the culture around us is trying to bend our children into a mold that denies God and holds to an identity that is contrary to everything we know to be true. But God has chosen you and your children to live for such a time as this. Your children are going to be His mighty champions. They are the arrows that will pierce the enemy's fortress. They are vessels God has ordained to display His glory on the earth. It begins as you set your children in the right direction by raising children that love God and serve God. One of the biggest tragedies of our contemporary culture is the desire of parents to be their child's best friend. Parents are parents, not buddies. God has anointed and called you to be the parent so that your child will grow up as a whole human being who knows and hears the Lord. Psalm 23 says, "Your rod and Your staff, they comfort me." The shepherd used the rod to gently nudge the sheep to keep them from falling over a cliff! Don't feel guilty for setting boundaries. Children need limits. You can be gentle, but firm. Direct, correct, protect, and love your kids as the parent God ordained you to be. As you do, you are teaching your children to love, honor, and fear the Lord, too. One of the most important things we learned over the years is that the Third Person of the Godhead is also the third parent. This is especially important if you are a single-parent home. I, Bonnie, especially appreciated this as Mahesh was often gone for long stretches at a time ministering in different corners of the world. There are so many times that I can look back and see where the Holy Spirit stepped into that empty place as Father, Mother, Comforter, Teacher, Deliverer, Caretaker, Lover of my children. He filled the gaps where we missed it. He came to be the wisdom where we didn't know what to do. He was the balance when Mahesh and I found ourselves at odds in regards to our parenting style. God foreknew and ordained your children to know Him and walk in His ways. He has a good future for them. So make room for Him in your life and in the life of your children. The Holy Spirit is your best friend and the best parent in the world. Stay connected to a vital local Church. This is the place that the Lord has ordained to form our children, to give them identity, strength, refuge, and friends with like values and vision. It creates a network for your whole family that offers both spiritual and natural support. We deeply believe that God wants you and your children to experience Him in a place of permanence and stability that comes from being rooted in relationships with other Believers in a local Church family. We have seen the fruit of extraordinary blessing and favor in the children that have been nurtured in the corporate anointing that comes through strong relationships and formation within the context of the local Church Body. The primary emotion of the Holy Spirit is joy, and so we always try to cultivate an atmosphere that is full of joy and humor. When our kids were young we made our family time talking about God and the Bible fun. We acted out Bible stories. The kids would get to play the different characters. We would often add a few fun details here or there just to spark their imaginations. When there was a prayer need, we would naturally include it into our daily conversation with our kids: "Let's pray for so-and-so today." Make God joyful, fun, and funny because children will fall in love with goodness and happiness. It will mark them. If you are in the stage where you feel like sleep deprivation is a state of life, your children need you 24/7, and you wonder if you are going to make it to the other side, know this: the Holy Spirit will never leave you or forsake you. He has entrusted you with the most precious gift, the life of His little ones who carry the seed of destiny for their generation, and He will be right there by your side every moment of every day. None of us has all the answers. Thank God He is bigger than our biggest mistakes. We are all on a journey together to greater glory! We honor and bless all of you who are raising up the next generation. May God bless you with His wisdom and grace, and His glory overshadow your house. 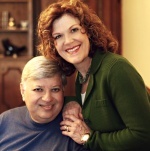 Mahesh and Bonnie Chavda: With over three miracle-packed decades of experience, Mahesh and Bonnie Chavda lead Chavda Ministries International, a worldwide apostolic ministry. The vision of CMI is to proclaim Christ's Kingdom with power, equip Believers for ministry and usher in revival, preparing for the return of the Lord. For over thirty-five years, the Chavdas have been reaching the nations with the Gospel accompanied by signs and wonders. Hundreds of thousands have come to salvation and thousands have received healing from critical diseases like AIDS and cancer through their ministry. Together, the Chavdas pastor All Nations Church in two locations, ANC in Charlotte, North Carolina and the sister church ANC in Atlanta, Georgia. They also spearhead a global prayer movement, The Watch of the Lord®, where they have been leading their congregation in weekly corporate prayer for more than a decade. How much water in a typical thunderstorm cloud? As I was watering my gardens last weekend, which took many hours, I began to think about how amazing God is! He can water a large area of the earth at once with so little effort and in such a short amount of time! As I was discussing my musings with Country Guy the question came up as to how many gallons of water are contained in a thunderstorm. Wouldn't you know that Google helped us find the answer! I thought you might be interested in these facts, too. According to calculations from Peggy LeMone, senior scientist at the National Center for Atmospheric Research, an average thunderstorm cloud contains approximately 275 million gallons of water. To help put this in perspective, with 750,000 gallons of water going over Niagara Falls each second, it would take six minutes for that amount of water to go over the Falls. Since one gallon of water weighs 8.33 pounds, the weight of the cloud would be 2.3 billion pounds (about 1.1 million tons). NOAA's National Weather Service calculates that one inch of rain over one square mile equals 17.4 million gallons of water which would weigh 143 million pounds (about 72,000 tons). This is the approximate weight of a train with 40 boxcars. By these calculations a typical cloud would weigh the equivalent of more than 17 of these trains! How wonderful to be woken up during the night to the sound of thunder and rain hitting the roof! It has been so long since we've had rain. The crops have been very stressed--to the point where I was beginning to worry they might die if rain didn't come soon. I have been watering my flower gardens all weekend. But now some refreshment has come. The rain gauge said .4 of an inch. We could use lots more, but I'm so grateful for this! I identify with the thirsty soil. I am feeling very dry spiritually. I have been meditating on Ps. 63:1 as I water my thirsty plants: "O God, You are my God; Early will I seek You; My soul thirsts for You; My flesh longs for You in a dry and thirsty land where there is no water." I'm praying for the rain of God's presence to wash over me, refreshing and restoring my soul just as it is restoring and renewing the crops. My constant prayer these days is "Let it rain, Lord! Let it rain!" 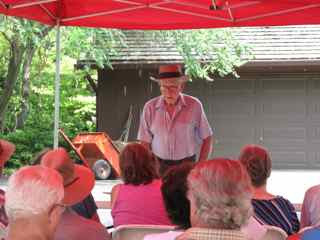 It was so interesting to hear Dr. Whitesides speak of the garden and the various species of plants that are growing there, including the rare Benjamin Franklin tree and several other plants not indigenous to this area but which are flourishing anyway. 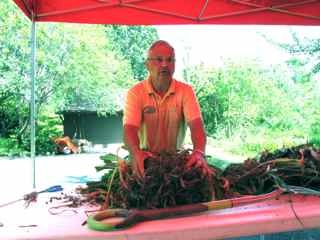 Jim Wuersch from 5-Acre Farm Daylilies (http://store.5acrefarmdaylilies.com/index.html) gave an informative talk and demonstration on dividing daylilies. After dividing a large clump he gave the divisions to those of us watching. This year the cultivar was Daniel Mann, a beautiful red daylily with a greenish yellow center. See picture here. Here are a few pictures I took at the garden. 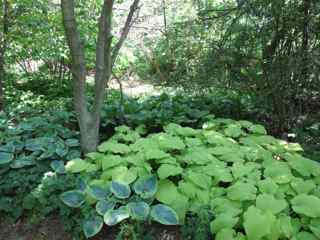 I especially love hostas so I was interested in these areas where they were used as a ground cover. Beautiful! Because of our unusual season this year many of the plants that are usually in prime bloom at this time of year have already finished blooming. Mom & I went to the Garden Ramble in 2010. 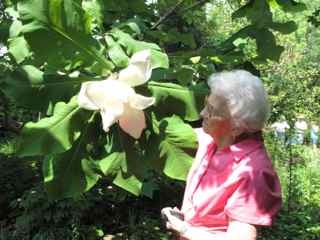 That is when I first heard of, and saw a big-leafed magnolia in bloom, and knew I must have one for my garden. Here is a picture of that spectacular bloom in 2012. The tree was almost through blooming this year. When I checked with nurseries in this area I was told these trees don't live here. As you can see it obviously does. Dr. Whitesides said he now has several growing that were planted by the birds from this original tree which was planted more than 20 years ago. Anyway, I eventually was put in touch with Randy Netzley of Netzley's Nursery (812-894-2121, 9111 E Moyer Dr, Terre Haute, IN 47803) where I purchased 2 of his seedlings that appear to be happily growing in my yard. Randy is an encyclopedia of knowledge on plants so I would highly recommend a drive out to his place if you live in the area (call first) to see his plants and learn about some you've never heard of. 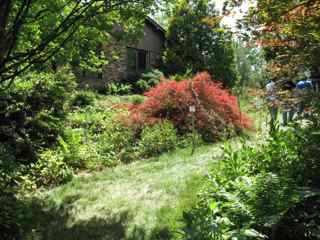 A trip to Netley's is as interesting as a walk through Dr. Whitesides botanical garden. Both are wonderful experiences for plant lovers. My friend, Melinda Fish, has just written a new book called The Accidental Intercessor. She sent me an advance copy to read and also to proof read for typos, etc. I was honored to be asked! I finished the book this morning and have to say it is one of the best books I've read recently. I loved it because it changed my perspective on the meaning of being an intercessor--one who stands in the gap; to bridge a gap--by helping me to see that just by living, we are intercessors. So often we think of intercession only in the terms of prayer, but have you considered that wherever we go as Christians we bring Jesus into daily situations because He lives in us, and consequently the world is changed by our lives? I think she said the book will be available in June as an E-book before it actually goes to print. I encourage you to get a copy. It will help you see, through stories and examples of people whose lives appeared to be insignificant but who actually had a profound effect on those around them, that your life has meaning and purpose right where you are just because you are you. I will post a link to where you can order it when it becomes available. We have been in Nebraska this week helping our daughter and son-in-law landscape their new house so I haven't been able to keep up as well as I would like on my blog. Even though it was hard work we had lots of fun working together and the gardens are now beautiful! Jess & Greg had gone to a nursery liquidation sale last weekend where they purchased many nice trees & shrubs at bargain prices. 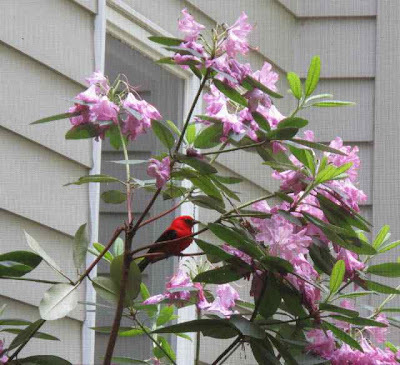 I brought plants I had divided from my gardens with us, and then we also purchased a few more shrubs at Menard's--several were Knock Out roses--one of my favorite "filler" plants which add so much color throughout the season. After tilling the soil we planted the trees, bushes and perennials, and then mulched it all. Jess said it seemed like "Extreme Makeover" because we did so much in such a short time--3 days! Two of our Illinois grandchildren went with us to spend time with their Nebraska cousins so we had a very full car driving to their house. (I'm so grateful for my minivan! What would I do without it?!) The kids had a great time together and mostly entertained themselves while we worked. The only unpleasant thing about the week was the weather. It was in the 90's with winds so strong we had difficulty keeping hold of the bags after we emptied the mulch! The plants, too, were whipped around in the wind and looked pretty bedraggled so we watered them several times to compensate. When we left Nebraska this morning a cold front had moved in and the temperature had fallen to the 50's. Rain was forecast but we were all disappointed that only a few sprinkles fell last night. It is extremely dry. We got home this evening and even though it has been pleasant weather here this week, the forecast for tomorrow is in the upper 90's with high winds. It seems we got home just in time to experience our Nebraska weather again! UGH! And we, too, very much need rain! What a great reminder from Joseph Prince! We are already branches! We only have to let the life of the Vine flow through us. In this verse, Jesus says, “I am the vine, you are the branches.” He did not say, “I am the vine, try to be the branches.” In other words, He wants us to realize that we are already the branches. We do not have to struggle to become the branches. As His branches, we only have to abide or remain in Christ our vine. How do we do that? We do that by simply being conscious every day of our position in Christ. Because we have received Christ, we are in Christ and are accepted in the Beloved. (2 Corinthians 5:17, Ephesians 1:6) God accepts us because we are in the Beloved and He is in us. And that is how God sees us today when we come into His presence. The devil knows that once you focus on your position in Christ, it will give you the power to change your condition and circumstances. John 15:5 says that you will bear “much fruit”. This means that when you pray against any lack, abundant supply will flow. When you pray for healing, sickness will leave. My friend, none of these things can happen by your own doing, but by His life which flows through you. Just as sap flowing through the branches of a vine will cause them to bring forth fruit, His life flowing through you will bring forth a bountiful harvest of prosperity, healing and miracles. You only need to remain conscious of who you are in Christ! I have been working on pushing back the woods around our property. That's what I call it. Every year about this time as the trees and bushes put out new growth it seems as if the woods is closing in on me. I almost feel like I need to duck when I drive down the lane because of the branches hanging down. 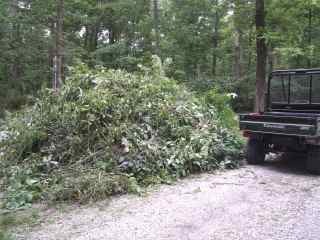 I haven't finished, but so far I have trimmed two piles of branches and small trees from the lane and around the edge of the back yard. We have significant poison ivy on our property so it is almost impossible not to get into it when I reach into the undergrowth, or up to cut branches. Several times I have had to stop trimming and hurry to the house to wash my arms with soap and water because I inadvertently brushed against those shiny green harmless-looking leaves. It has been worth the extra time that took though because amazingly I do not have any poison ivy on my body! I actually very much enjoy this work even though it takes a lot of effort and I am exhausted at the end of the day. What a sense of accomplishment it gives me when I see how much space I have reclaimed and how beautiful it looks! Here is one of the piles. I left the Mule in the picture so you would have perspective on how many branches I've cut. I have actually added quite a few branches since I took this picture, but you get the idea, I'm sure. As you know from previous posts I am a great fan of Francis Frangipane. He is a practical and wise teacher of the Word. His articles contain such truth that I often find myself saying "Of course!" This one is no exception. In it he has much to say about our tendency to criticize/judge and call it discernment. I believe we often criticize and judge--not out of the heart of God with understanding of the person's intent or circumstances, but out of our own heart of jealousy, envy, pain, bitterness and anger. I once heard "Be careful not to judge because someone is judging you in the same way you judge others." That has been my experience! Someone will be saying something critical about another person when I realize that is the very thing I have thought about the person speaking. Oh, that I would not judge, but instead discern what is in the person's heart and be able to love and help them to become all that God created them to be. We will never possess true discernment until we crucify our instincts to judge. . . The judgmental carnal mind always sees the image of itself in others. Without realizing it is seeing itself, it assumes it is perceiving others. Jesus refers to the person who judges as a "hypocrite." The Lord is not saying we should totally stop thinking about people. He wants us to be able to help one another. The emphasis in Jesus' command to "not judge" is summarized in His concluding remark: "First take the log out of your own eye, and then you will see clearly to take the speck out of your brother's eye." The way we help is not by judging but by seeing clearly. And we do not see clearly until we have been through deep and thorough repentance, until the instinct to judge after the flesh is uprooted. We have seen that Jesus paralleled speaking to people about their sins with taking specks out of their eyes. The eye is the most tender, most sensitive part of the human body. How do you take a speck out of someone's eye? Very carefully! First, you must win their trust. This means consistently demonstrating an attitude that does not judge, one that will not instinctively condemn. To help others, we must see clearly. If you seek to have a heart that does not condemn, you must truly crucify your instinct to judge. Then you will have laid a true foundation for the gift of discernment, for you will have prepared your heart to receive the dreams, visions and insights from God. You will be unstained by human bias and corruption. When Country Guy came home from work the other day this surprise was waiting for him. The snake was actually lying on the mat (seen in the picture above) which is in front of the back door. He thought I was playing a trick on him with a fake snake but then it moved. By the time I got my camera it had slithered in front of the garage door. 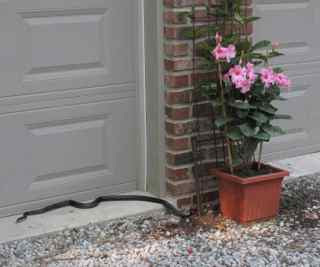 We think it is a rat snake, which is harmless, but still I don't enjoy thinking it could be visiting in my flower gardens. 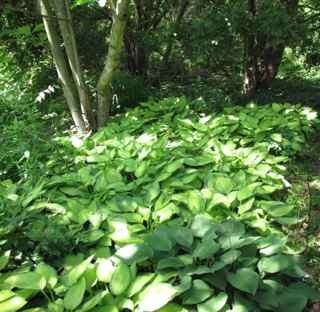 Fortunately, I see very few snakes on our property--otherwise we might not have so many beautiful gardens! Here are the suggestions on ways to stand up for Israel from Jack Hayford's article, most of which I posted yesterday. Let's be diligent to do all we can do to obey God and support His people. 1) Equip yourself with reliable information, avoiding bigotry and disallowing “blind spots.” Recognize the disposition of the popular press. Assess reports cautiously but not with paranoia. Become familiar with the basics of history in the Middle East, and understand the past century. 3) Prayerfully consider visiting Israel as a point of practical support. Israel as a point of your Bible-based commitment to God. 5) While acknowledging the terrorist habits of radical Muslims, be gracious to others. Take action because it’s such a pivotally important time. Today, the showdown that we face is so close to being the nations of the earth against Israel and whoever is left that stands with them. The final issue will be “Who is for Christ and His way and who isn’t?” The Lord has called us to be a people who will touch people and will stand with moral and biblical convictions for critical issues...and this is one. We watched a video of Jack Hayford last night in which he discussed the reasons why we must stand with Israel today. Many have not understood Israel's significance in our past and future. Many even believe the Jews are no longer God's chosen people, but that Christians have moved into that spot. Jack gives very convincing evidence that we must be diligent in our support and prayer for Israel. Because the entire article is very long, I have omitted some of Jack's supporting evidence. To read it in its' entirety click here. I will post "Actions You Can Take To Stand Up For Israel" tomorrow. Israel is a land about which God says – uniquely, prophetically, redemptively, and repeatedly in the Bible – “This is Mine.” God refers to Israel as He does to no other land on Earth. Israel was raised up to be a light to the Gentiles. The Church at its inception was virtually entirely Jewish, and it remained so until the Gospel began to spread. Ultimately the Gospel spread to Antioch – where the first Gentile congregation began – the base from which the Gospel spread into all the world. We are living in a sobering moment in history that calls us, as believers in Jesus Christ, to take a stand with Israel. We could be people of the last hours. We are not to be passive in the face of prophecy; we are called to pray with passion, to intercede, and to minister according to the words of the Savior who said it is not our task to speculate when the end will be. It is our responsibility to do Kingdom business until He comes (Luke 19:13). This is not about politics, this is about the Word of God...but the political ramifications are extremely dramatic. Scripture declares there will come a time when all the nations of the world will turn against Israel. It is so highly conceivable this could happen in our time that it is critical to outline: why we should stand with Israel today. 1) Every believer is charged to make the Jews a priority in their value system and to render thanksgiving from their hearts for God’s work via them as a people. . . So Scripture speaks to us very clearly: we’re dealing with the roots of everything that has to do with the revelation of God to humankind. The proof of this is in the very existence of the Jews as a people and the fact that they’ve been recovered as a nation. Today the struggle is over Jerusalem, over Israel, and over the presence of Jews and their right to a have a land. There are few nations willing to make an abiding commitment to stand by the Jews and Israel, but the Bible says God will honor those who do. 2) Our place in God’s present order inextricably links us with the Jews as a people and thereby the land of Israel according to the Word. When we put our faith in the Redeemer who came through the Jews, we enter into a line of those who have trusted God according to His revealed grace and redemptive purpose. Scripture declares that, spiritually speaking, when you receive the Lord, you become a Jew (Romans 2:28-29; Galatians 3:26-29). If you are a believer, you cannot be consistent with the whole of Scripture and take a position that is passive toward the Jews and Israel. 4) Israel’s present conflict is neither by their initiative nor perpetuated by expansionism on their part. The general attitude of the world today regards the Palestinians as the underdog, but Israel is defending the land covenanted to them in 1917 and established by the United Nations Assembly in 1948. The Palestinian goal is not to secure a homeland but to drive Israel out altogether. For the sake of mounting public opinion against Israel, surrounding, well-resourced Arab nations have never offered refuge to the Palestinians. The majority of the world doesn’t know this, and nobody is bothering to tell them because sympathies are so overridden by other forces. 5) To stand with Israel is not to oppose Arab peoples as an entity or to oppose the rights of Arabs living in Israel to a peaceful, politically secure, and prosperous life. God has no disposition against any human being, certainly not Arabs who are the offspring of Ishmael, the other son of His chosen leader Abraham. Standing for Israel doesn’t require an anti-Arab stance and doesn’t require us to be loveless toward other peoples. 6) The relentless animosities of sectors of the Arab world are not merely political causes but are driven by spiritual powers that will not be satisfied until Israel ceases to exist. The forces opposed to Israel are not simply those of people who don’t like Jews. We are Caught in the stream of spiritual forces greater than humanity, forces that cannot be overthrown politically or by the power of persuasion. These forces can only be broken by intercessory prayer where principalities and powers are cast down. 7) The same spirit driving these animosities is equally opposed to Christians as to Jews and in time will eventually bring persecution to both. Just as Scripture states there are two witnesses that will be put to death in Jerusalem at the very end of time (Revelation 11), there have been two witnesses that have stood for God throughout history – the Jews and the Christians. The hostilities and animosities are just as leveled at believers as they are at Israel, because there is a spirit in the world that is against all that is called God and everything about Him. 8) A biblical assignment and a divine promise summon our stand in faith, our intercession with expectancy, and our support with promise. We are called to stand with Israel today because we could be people of the last hour. The Lord has called us to be people with moral and biblical conviction, walking wisely and knowing His Word. He will honor those who make an abiding commitment to stand with the land He’s called uniquely His. (Psalm 122:6). As you can see, I've been experimenting with different looks for my blog. Do you like this one? A question for those of you who have been following it for some time--is this an improvement, or do you like the original better? This article was a recent post from the Elijah List's email newsletter. It is a great reminder that God wants our hearts. What we often call worship--singing songs to and about Him--can be an expression of worship, but true worship involves total surrender of our hearts and lives to His Lordship and that can be expressed in many ways. In America, we are living in a day where there is a church on every corner. Leaders have provided a smorgasbord for seekers to choose from in order to connect with their Creator and grow in a meaningful relationship with Jesus. Sadly though, Goldilocks is still not satisfied. She can't find the church that is "just right". The above passage of Scripture comes from a precious conversation Jesus had with a Samaritan woman at a well. She asked Jesus "where" to worship, however, Jesus replied with "how" to worship. Unfortunately the "how" is often determined by the "where" but it doesn't have to be so, beloved. The hour is coming and I believe now is, that true worshipers will worship the Father no matter where they are. It won't matter if the lights are bright, dim or flashing. It won't matter if the worship is fast, loud, professional and planned, or slow, quiet, simple and spontaneous. The worshiper with a true heart of worship will be able to worship the Father in spirit and truth, despite any outward hindrances because the Spirit of God who reveals all truth dwells inside of them. You see, worship is not a musical expression, therefore true worship does not have to be affected by the atmosphere around us. In Greek, the word for worship that Jesus is talking about is expressed by falling to one's knees, bowing before a Superior in humility and submission or to kiss the hand in respect and reverence. In Luke 7, we see a sinful woman standing behind Jesus weeping. She then washed His feet with her own tears and wiped them with her hair. She kissed His feet, which is much less respectful than kissing the hand, yet in this one act she demonstrated a genuine act of worship. She knew the Truth and He set her free so that no matter what was happening around her she was going to worship her Savior. We see another cry of genuine worship in the Old Testament coming from the prophet Job. After losing everything precious to him, Job declares, "The LORD gave, and the LORD has taken away; blessed be the name of the LORD" (Job 1:21b). After all, Job continues to say, "Shall we indeed accept good from God, and shall we not accept adversity?" (Job 2:10). Beloved, when we go to work and find a pink slip waiting for us, God is still God and worthy of our worship. When we come home and find our spouse has left us, when the cancer has returned, when everything is falling apart, God is still God and worthy of our worship. He alone can hold us secure in this storm and so, at His feet, may we fall. There is a beautiful revelation in the Hebrew word used here for praise that brings this home for me. The Hebrew word used here for praise is not your typical word for praise, this one is shabach (Strong's #7623). While shabach means: to commend, praise, adore, or to glory in something, interestingly, it also means to still, quiet or pacify someone. Therefore, proceeding from a heart of worship, shabach can be seen in two dimensions: praising or calming. This reveals that praising God has the power to soothe our screaming soul. True worshippers are those who earnestly love God with all their heart, soul and strength despite the circumstances. Falling at the feet of Jesus, worshiping the One who is worthy of all our praise, we will be filled with the Holy Spirit and the truth of His outrageous love for us. From this posture, although we are hard-pressed on every side, we can worship knowing we will not be totally crushed. When we are perplexed and confused we can adore Him because we are not in despair. We can kiss His feet although we feel forsaken, yet knowing the truth, He promised He would never leave or abandon us. Jesus really is who He says He is. I posted this quote by Ronald Reagan on my blog in April, 2011, but found it again when I was looking for another article. It seemed a good idea to bring it forward to remember again. I'm sure that some of you who haven't looked at this blog's archives would be interested in thinking about it, because it certainly is worth pondering. Have you noticed my new "Translate" gadget? Thank you, Google, for creating it! I am so amazed that it will translate every word on my entire blog into one of 54 different languages just by choosing the language. Now those of you from other countries can read it in your native language. Try it if you haven't already. I've tried several because I'm fascinated with this capability, aren't you? I would love to hear from any of you who speak another language. Is it an accurate translation? Please let me know. A few weeks ago Country Guy & I watched a podcast of Brother Yun speaking at Bethel Church. We had not previously heard of him, but were amazed and inspired by his message of enduring --and the church prospering--during the persecution of Christians in China. The stories he told of his imprisonment, miraculous escape, miracles that have happened in his ministry, and divine visitations were almost unbelievable. They very much paralleled things that are described in the book of Acts. But why should we be surprised? Isn't that supposed to be normal Christianity? I was so intrigued by his testimony that I ordered his book, The Heavenly Man, from ABE books. When I received it yesterday I couldn't resist beginning reading it. His story is incredible! As I discovered the difficulties of Christians in China and the amazing testimonies of them not denying the Lord Jesus even under the threat of death and imprisonment, I was ashamed of my shallow faith. Will I stand up when persecution comes? Am I willing to die for my belief? This book challenges much of Western Christianity's complacency and self-centeredness. I highly recommend it. On Sunday, Country Guy and I had lunch on the screened porch. 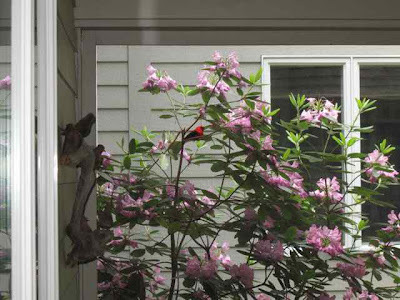 As I turned to admire the rhododendron in the little garden between the porch and the garage I noticed a scarlet tanager resting on one of the branches. He sat there for quite some time and didn't seem to mind when I went into the house to get my camera. He was still there when I returned. He must have been waiting to pose for me. A wonderful gift! How much beauty can one person take in at one time?!! Do you only believe, or are you also committed? Here is another article by Dr. Mercola that contains more proof on the detrimental effects of sugar on our bodies. I need to read it (watch the video) many times until it becomes part of my thinking and changes the way I live. Right now, I believe it is true, but I haven't given up eating sugar. I want to, though. Recognizing that caused me to meditate on the difference between belief and commitment. Many people say they believe in Jesus, but their lives are not changed because of that truth. To really follow Him also entails commitment to that belief. If we are to be His disciples we must do what He says to do and commit to live as He lived. What do we mean when we say we believe in Jesus? Are we saying we believe it is true that He is the son of God, and the only way to salvation, but then we don't totally surrender our lives to live out that belief? I don't think that is what it means to be a Christian. Could that be what Jesus meant when He said in Matt. 7:21: “Not everyone who says to Me, ‘Lord, Lord,’ shall enter the kingdom of heaven, but he who does the will of My Father in heaven." Between 1985 and 2010, average daily caloric intake rose by eight percent, while diabetes rates rose by 727 percent. Clearly, total calorie consumption cannot explain the meteoric rise in obesity-related diseases. Researchers discovered that it’s the increase in total fats and carbohydrates specifically that’s causing the massive weight gain in people around the world. It’s the combination of fat and carb that causes metabolic disruption. The only food on Earth that is both a fat and a carbohydrate, is sugar, which includes both sucrose (regular table sugar) and high fructose corn syrup—both of which contain both glucose and fructose. Your body metabolizes glucose and fructose in two distinctly different ways. Fructose is metabolized much like alcohol, and damages your liver and causes mitochondrial and metabolic dysfunction in the same way as ethanol and other toxins. In the video above, part two of the excellent series "The Skinny on Obesity," Dr. Robert Lustig, Professor of Pediatrics in the Division of Endocrinology, and Elissa Epel with the Center for Obesity Assessment, Study and Treatment at the University of California, continue the discussion about the impact of sugar on disease rates around the world. If you missed part 1, you can view it here. While total calorie consumption has contributed to increases in diabetes rates around the world, they don't explain the whole story. In 1985, the year I finished my residency and started in private practice, the average number of calories consumed per day for the global population was 2,655. At the time, 0.62 percent of the global population had diabetes. By 2010, the average daily caloric intake had risen to 2,866—an eight percent increase—but surprisingly, the diabetes rate rose by a whopping 727 percent, to 5.13 percent of the total global population. When scientists dug deeper to determine what it is that people are eating that's contributing most to the global crisis in obesity and obesity-related diseases, they discovered that a calorie isn't just a calorie. The source of the calories you consume makes all the difference in the world. They discovered that it's the increase in total fats and carbohydrates specifically that's causing the massive weight gain in people around the world. What's more, there's just ONE food on Earth that, because of its unique composition, metabolizes in your body as both fat and carbohydrate—and that product is sugar. Sugar is the only calorie source that correlates with the increase in diabetes. In 1985, when the world-wide sugar consumption was 98 million tons, diabetes affected 30 million people. By 2010, sugar consumption had risen to 160 million tons, and global diabetes prevalence reached 346 million people. Overall, sugar is 50 times more potent than calories, in terms of causing diabetes. But why does it have this extraordinarily potent effect? The answer lies in its unique structure. As just mentioned, it metabolizes as both fatand carbohydrate, and the reason for this is because it contains both glucose and fructose. These two sugars are not interchangeable, and your body processes each of them differently. Sucrose (table sugar) is 50 percent glucose and 50 percent fructose. High fructose corn syrup (HFCS) is anywhere from 42 to 55 percent fructose depending on which type is used. Glucose is the form of energy your body is designed to run on. Every cell in your body uses glucose for energy, and it's metabolized in every organ of your body; about 20 percent of glucose is metabolized in your liver. Fructose, on the other hand, can only be metabolized by your liver, because your liver is the only organ that has the transporter for it. Since all fructose gets shuttled to your liver, and, if you eat a typical Western-style diet, you consume high amounts of it, fructose ends up taxing and damaging your liver in the same way alcohol and other toxins do. In fact, fructose is virtually identical to alcohol with regards to the metabolic havoc it wreaks. According to Dr. Lustig, fructose is a "chronic, dose-dependent liver toxin." And just like alcohol, fructose is metabolized directly into fat—not cellular energy, like glucose. So eating fructose is really like eating fat—it just gets stored in your fat cells, which leads to mitochondrial malfunction. Not even fatty fruits like avocado or coconut have this effect, because your body treats them as either a fat or a carb—not both. Sugar is the only food that functions as both a fat and a carb simultaneously, and it is this combination of fat and carb that causes metabolic derangements and, subsequently, disease. So, please, don't be fooled: when it comes to sugar, the claim you hear on TV, that "sugar is sugar" no matter what form it's in, is a misstatement that can, quite literally, kill you—albeit slowly. To further explain the differences between glucose and fructose, and the similarities between fructose and ethanol (alcohol), let's review how each is metabolized in your body. Whatever glucose your body doesn't need immediately gets converted into glycogen for storage in your liver. Glycogen can be easily converted to energy when you need it. Your liver has no limit to how much glycogen it can store without detrimental effects. A small amount of pyruvate is produced, which ends up being converted to ATP (the chemical storage form of energy) and carbon dioxide. Insulin is released by your pancreas in response to the rise in blood glucose (i.e., blood sugar), which helps the glucose get into your cells. Without insulin, your cells would not be able to process the glucose and therefore would have no energy for movement, growth, repair, or other functions. Insulin is key to unlocking the door of the cell to allow the glucose to be transferred from the bloodstream into the cell. When you consume 120 calories of glucose, less than ONE calorie contributes to adverse metabolic outcomes. Fructose is immediately converted to fructose-1-phosphate (F1P), depleting your liver cells of phosphates. This process produces waste products in the form of uric acid. Uric acid blocks an enzyme that makes nitric oxide, which is your body's natural blood pressure regulator. Hence your blood pressure rises, leading to hypertension. Elevated uric acid levels can also cause gout. Almost all of the F1P is turned into pyruvate, ending up as citrate, which results in de novo lipogenesis, the end products of which are free fatty acids (FFAs), very low-density lipoproteins (VLDLs are smaller, denser LDLs that get stuck beneath your epithelial cells and stimulate plaque formation), and triglycerides. The end result is hyperlipidemia. Fructose stimulates g-3-p (activated glycerol), which is the crucial molecule for creating triglycerides within fat cells. The more g-3-p that is available, the more fat is deposited. When you consume 120 calories of fructose, about 40 calories contribute to adverse metabolic outcomes. Your liver converts ethanol to aldehydes, which produce free radicals that damage proteins in your liver. Excess citrate is formed in the process, stimulating the production of FFAs, VLDL and triglycerides. The resulting lipids, together with the ethanol, create a cascade of inflammation, causing hepatic insulin resistance, liver inflammation and cirrhosis. Fat accumulation in your liver can also lead to fatty liver disease. FFAs cause your skeletal muscles to become insulin resistant. This is a worse form of insulin resistance than hepatic insulin resistance and can lead to type 2 diabetes. When you consume 120 calories of ethanol, about 40 calories contribute to adverse metabolic outcomes—the same amount as fructose. As you can see, in nearly every way, fructose is metabolized the same way as ethanol, creating the same toxic effects in your body. However, while Dr. Lustig uses the term "liver toxin" to describe fructose, he's also careful to note that it's not fructose per se that is toxic. There are instances when your body can use it. The problem is that people consume so MUCH of it that it turns toxic by virtue of the fact your body cannot use it. It simply gets shuttled into your cells and stored as fat. So it's the MASSIVE DOSES you're exposed to that make it dangerous. If you want to shed excess pounds and maintain a healthy weight long-term, and RADICALLY reduce (and in many cases virtually eliminate) your risk of diabetes, heart disease and cancer, then start getting serious about restricting your consumption of fructose to no more than 25 grams per day. If you're already overweight, or have any of these diseases or are at high risk of any of them, then you're probably better off cutting that down to 10-15 grams per day. I've also included a chart below of fructose levels in fruit to give you an idea of what 25 grams a day looks like. Just remember fruit is only one source, as fructose is a staple ingredient in the vast majority of sweetened beverages and processed foods of all kinds, from pre-packaged meals to baked goods and condiments. It's important to realize that when we talk about "sugar," ALL sugars are included. So when you're evaluating your sugar consumption, you can't stop counting once you've accounted for the number of spoons of table sugar you've added to foods and beverages. You must also include all other types of sweeteners, such as HFCS, honey and agave. But please do not resort to using artificial sweeteners to sweeten your food once you limit sugar. There's little doubt in my mind thatartificial sweeteners can be even worse than sugar and fructose, and there is scientific evidence to back up that conclusion. I've compiled a long list of scientific studies into the health effects of aspartame, and it covers a range of concerns, from behavioral and mood changes, to brain damage, weight gain, pre-term delivery, and cancer. Consuming artificial sweeteners can cause distortions in your biochemistry, and if you drink diet soda in an attempt to lose weight, it won't help you. Instead, most studies looking at this show very clearly that diet soft drinks actually increase your obesity risk by stimulating your appetite, increasing carbohydrate cravings, and stimulating fat storage! And remember, switching to cane sugar, honey, date sugar, coconut sugar, brown rice syrup, fruit juice, molasses, maple syrup, sucanat, sorghum, turbinado or agave syrup will NOT ameliorate any of the risks of sugar consumption, as they all contain HIGH amounts of fructose. If you're in the habit of reading labels, you've no doubt realized it's difficult to find any kind of processed, packaged food that does not contain some form of added sugar or high fructose corn syrup. And low-fat or "diet" foods tend to be the worst of the bunch. The reason for this is that when fat is removed, most of the flavor goes with it. To compensate, sugars are added. In short, most processed, packaged foods are toxic for your metabolism and lead to mitochondrial damage and disease. Considering the fact that many eat virtually nothing BUT processed foods, it's no wonder obesity-related diseases are peaking. The answer, of course, is to return to a more natural diet, meaning a diet of whole, preferably organic, foods, cooked from scratch, without added sugars and other chemicals. Ideally, you would eat as much of your food raw as possible, as cooking destroys many valuable nutrients. Like many people, I have very little "free time" in my life, but still I am committed to preparing over 95 percent of my meals in order to preserve my health. A major leap in the right direction would be to strive for a diet of 90 percent non-processed food and only 10 percent from other sources. To help you get started, I've created a complete nutritional program that is freely available online. It's divided into beginner, intermediate, and advanced, to help you progress at your own pace.